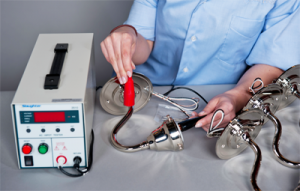 Greenwich Metal Finishing restores and fabricates lighting fixtures to meet the exacting standards of Underwriters Laboratories (UL), an independent, not-for-profit product safety testing and certification organization. The UL Mark is one of the most recognized and trusted symbols in the world. Once a lighting fixture is “UL Listed” it can be installed in accordance with local electrical codes. Greenwich Metal Finishing can provide UL marking for your chandelier, sconce, lamp, or lantern, whether it requires restoration, rewiring, or custom fabrication. Our certification also covers electrifying antique fixtures. However, in instances when UL-recognized components could jeopardize the historical integrity of an antique fixture, we can advise you on available options.